Is A New "Great Schism" Brewing? Is there a new, Great Schism brewing? With all the shenanigans boiling over regarding divorce and remarriage, as well as heated discussions and imprecatory language recently regarding LGBTQ issues, and on, and on... You should probably start upping your prayer quotient -- especially because much of the condemnation is being directed towards who were previously known as the mainstream of believers -- those who hold to the orthodox teachings of the Church. 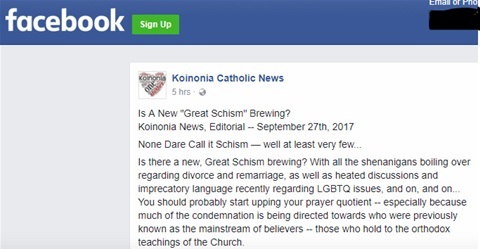 Those of you who have been following along with Koinonia News (KN) should understand by now that things are not all peaches & cream with the largest and most prominent Catholic Church in the world. There are mixed messages and damning rhetoric coming from many sectors, including the very heights of the curia. Whether by their silence or tacit approval, the pope and his top councilors, the Cardinals appear to be allowing heresy to reign freely in their jurisdiction. Many faithful are rising up in indignation and wonder at what is transpiring. Michael Voris of Church Militant (CM), in one of his youtube videos, said recently that the Church is in the midst of a “de facto schism." On September 23rd, KN published an article in reference to the “Filial Correction,” a letter sent to Pope Francis directly, challenging him to recant several perceived heresies in his own letter “Amores Laetitia,” and other messages. What KN found interesting in that letter of correction was a lack of concern for the other fallout from Amores Laetitia -- in particular, the wink, and a nod that many RC prelates are giving towards all things LGBTQwxyz. The bishop of the diocese of San Diego, California (Robert McElroy) for instance has been on my radar often over the past couple of months specifically regarding his support for homosexual communicants, and Fr. James Martin, S.J. Yes, you read that correctly, McElroy is encouraging active, unrepentant homosexuals and others in the LGBTQ community to full participation in the sacramental life of the Church. Not only that, but he is also actively censuring parish priests for supporting pro-life initiatives in their parishes. Additionally, McElroy recently called faithful Catholics who criticize Fr. Martin and the LGBT agenda a "cancer" in the Church. Both McElroy and Martin, in lockstep with Alynski-style rhetoric, are utilizing “hate” speech to condemn faithful Catholics who are seeking to maintain an orthodox understanding of their faith practice. For McElroy, this was in the context of his op-ed article in the Jesuit magazine “America.” In this article, McElroy called out conservative Catholics for "homophobia" and "bigotry.” He also decried that those involved in speaking against Fr. James Martin (Editor at large for America) and his book “Building a Bridge” were involved in a "campaign of distortion” that must be challenged and exposed for what it is.” He continued; "not primarily for Father Martin's sake but because this cancer of vilification is seeping into the institutional life of the church. McElroy also utilized a common social media term of derision, "The larger question is how will the church deal with trolls?” Martin has suggested that conservatives have no right to speak out and that we should be "silenced." Both KN and CM have been blocked from commenting on Fr. Martin's social media accounts. McElroy, Martin, and other RC priests and prelates have an agenda to transform the Church of God into something pleasing to the modern ear, literally embracing all proclivities of our secular world as acceptable. Anyone who dares to stand in their way is branded with liberal hate speech and invectives, suggesting that we, conservatives are the ones actually producing a "distortion of fundamental Catholic moral theology.” This is the Marxist and socialist tactic used to silence their opponents. What McElroy, and Cardinal Blase Joseph Cupich seem to believe is that we need a church of less “judgmentalism.” When in the name of all this is holy, did it suddenly become a bad thing to make moral judgments and teachings regarding sin? In this light these folk seem to be taking Pope Francis' words "Who am I to judge?" out of context, we are not to judge persons, that is up to God alone. Sin, on the other hand, is another matter altogether. McElroy continued, stating that "Chastity is not the central virtue in the Christian moral life," he declared. "Our central call is to love the Lord our God with all our heart and to love our neighbor as ourselves.” No, Bishop McElroy, conservative Catholics are not saying that “Chastity is the central virtue.” However, it is very much an important virtue. When you defend a heretic priest who tells LGBTQ Catholics that they are not bound by the laws of chastity, you make yourself a heretic as well. When we have high-profile cardinals, bishops and priests openly declaring that sin is a non-issue, and those at the heights of the magisterium turning a blind eye something is terribly wrong within the Church of Rome. KN for one is echoing Voris’concern over potential or ongoing schism. Like those priests, theologians and others who've signed the Filial Correction, we call on Pope Francis to recant error and silent support of active heresy in your jurisdiction. Other jurisdictions, even those not in close communion, look towards the Chair of St. Peter as our elder brother of the faith, for guidance in troubled times. There are many issues of concern that the laity and others have concerning the Catholic rhetoric of our day. KN published an “Open Letter to Pope Francis” (https://www.facebook.com/KoinoniaCatholic/posts/1990228551263944) on September 15th, well before the Filial Correction was released to the public. Like the signatories of the letter of correction and the four cardinals who signed the “Dubia,” KN humbly seeks clarification where possible, retraction where necessary, and enforcement of Canon Law, equitably and uniformly around the world.